What is the Difference between Shotcrete and Concrete? Dear reader we have discussed about shotcrete in our previous posts but not mentioned the difference between it and concrete. This nothing but a mass of concrete or mortar but the difference is placement technique. In this technique concrete or mortar is conveyed by using a hose, transfer through it and projected pneumatically at a high velocity to/onto a required backup surface. In normal concreting operation, we have to use temping or vibration techniques to expel out any short of voids. In shotcrete the compaction is done by the exerted force of jet that impact the backup surface. As impact compacts shotcrete materials onto the surface to support material itself avoiding sloughing or sagging, no additional temping or vibration is required in shotcrete operation. This technique of shotcreting is even applicable for vertical face and overhead too. So formwork is not required in shotcrete operation whereas in normal concrete work significant time and cost involved in this respect. The workmanship required for shotcrete operation must be of considerably higher than normal concreting work. 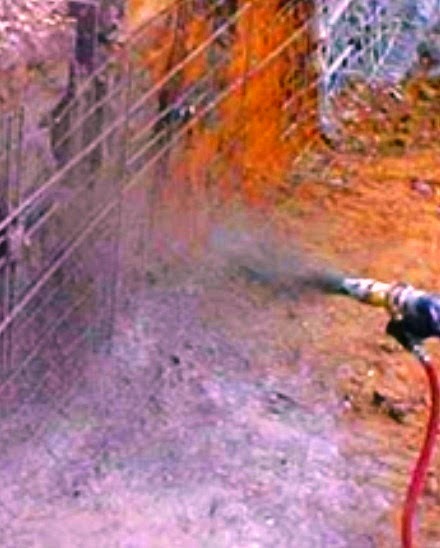 Dear reader in our previous post we have discussed about requirements of ACI shotcrete nozzleman.